Updated September 9, 2008 — In response to a tweet, a number of analysts have left new comments about specific types of marketing language that vendors should avoid. While the US Federal Trade Commission in the Lanham Act said that puffery is “harmless exaggeration or colorful hype” and is not prosecutable as false advertising, too much hype can severely damage a vendor’s credibility. 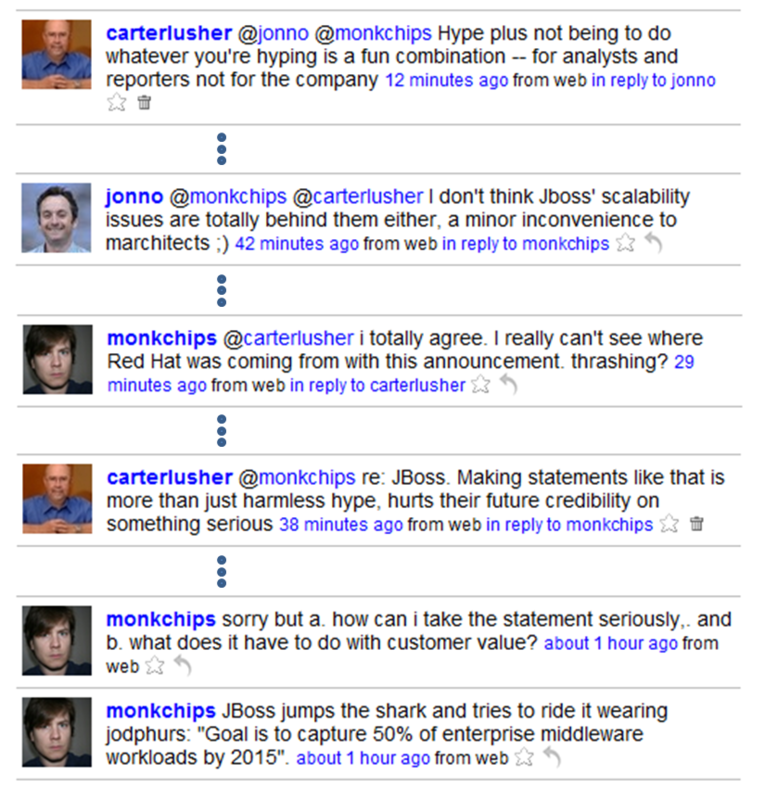 This was reinforced the other day when I participated in a Twitter conversation (right, click to enlarge). Redmonk’s James Governor (“Monkchips”) in response to a marketing statement by a vendor about its product said “sorry but a. how can i take the statement seriously,. and b. what does it have to do with customer value?” Later another analyst, Jon Collins of Freeform Dynamics (jonno), joined in with the scathing “don’t think (products’) scalability issues are totally behind them either, a minor inconvenience to marchitects ;)”. While you might dismiss this because it is happening on Twitter, think again. This Twitter chat represents the visible tip of the iceberg. Think about how many other chances these analysts have to convey this opinion to the press, other analysts, IT managers and the like? Reporters are starting to follow analysts’ micro-blogging like Twitter so this can become a PR problem as well. Don’t assume that “nobody is following Tweeting analysts” because their followings can be quite large (e.g., Forrester’s Jeremiah Owyang has over 3,300 followers with new ones everyday). However, the focus of this post is not on Twitter but on the issue of hype. SageCircle has identified hype as one of the five “analyst hot button” issues that can needlessly derail a vendor-analyst briefing. The big problem is that analysts really listen to marketing language and don’t blow off some puffery like a prospect would. So claiming superiority or asserting that your product is “Best in Class” can be a red flag if the claim does not match the analyst’s view of the market. What happens next is rarely good for the vendor representatives doing the briefing. The analyst might interrupt the briefing probing for a definition of what it really means to be “the leaders” or “world class” or whatever and then demand hard evidence that the vendor really meets the criteria. Then the briefing could be consumed on what is really a tangential discussion. Or the analyst could sit quietly with a smirk on his or her face while thinking “What a load of BS, I bet everything they are saying is BS.” The second outcome is worse because it implies long term damage to credibility and may go unnoticed. The analysts react in these fashions not because of evil cynicism, but because their jobs are to figure out what is happening in markets and to help IT buyers manage the risk surrounding technology services and products purchases. Hype backed up by facts could indicate a shift in the vendor landscape. Hype that nothing but exaggeration could be a risk for tech buyers. As consequence, AR teams have to be very careful that the claims of their spokespeople do not stray in to the overheated hype territory. Bottom Line: Hype is a major hot button that can send a briefing off on a tangent or, worse, cause relationship damage if the spokesperson or analyst thinks the other side is being unfair. Often the same idea can be expressed without using language that is a red flag to analysts. Analysts – What are the key words that alert you that the vendor is hyping their capabilities or accomplishments? Are there other reasons why you think that hype is a poor tactic to use with analysts? – we’ve open sourced our code — sounds good. but how large is community? who are primary community contributors? What OS licensing model is being used? What commercial development is occurring based on this open source model? @jowyang @Brightidea: “What if there are no reports? Is that the vendors fault?” No, but making unsubstantiated claims is a vendors fault. @instantBP @carterlusher what i call breathless marketing “First”, “Only”, “No competitors”, vendors please delete these. @carterlusher Nice list, also ‘our only competition is in-house development’ <– VERY rarely true. And who keeps the analysts in check?!? Forrester’s Jeremiah Owyang is a one man hype machine for “Social Media” and “White Label Social Networks”. Unfortunately everyone in the echo-chamber, including the over-hyping vendors, want the analysts to hype the category…Forrester predicts Social Networks to reach ~2 billion by 2013…care to name your source? Oh, I forgot you are your own source. Get off you high horse…it’s time someone called out these pay-to-play hucksters. Hi JClancy, Thanks for the comment. It is absolutely the case that analysts and firms can overhype trends in the marketplace. However, there are also situations where analysts underplayed or completely missed important trends. That is why is it critically important to be a good research consumer and balance information and insights from various sources. Also it is important that analyst clients use inquiry to “peel the onion” to better understand sources of data, decision frameworks and research methodology. I’ve been covering white label social networks before I became an analyst, and that’s now the coverage area I have. How do you think I’m hyping them? I talk about them on my blog and on twitter, I don’t tell anyone to buy them, but merely tell my findings. I also spend time talking about the challenges of the social media space, have you read these posts? You can email me if you want to discuss more, I’d love to hear your suggestions, and your thoughts. Have you read Oliver Young’s report on the prediction of the market? Maybe this is a good time to take a closer look at look at the sources and methodology. Lastly, to answer your question, who keeps analysts in check? The answer is the market does, and people like you, I’m thankful, please email me, I’d love to extend the conversation with you. ← Are you guilty of monologuing and death by PowerPoint?